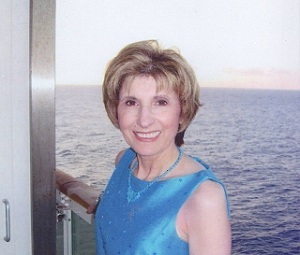 Recipe from National Foundation for Celiac Awareness (NFCA) volunteer Annette Marie of Best Life Gluten-Free. 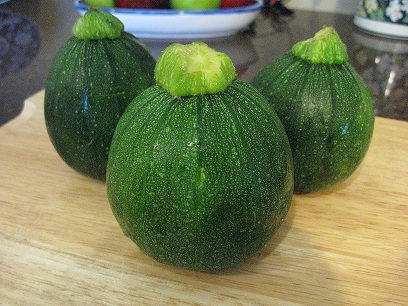 There is a local farmers’ market near me in New Jersey that carries these little zucchinis that are a different shape from those you typically see: these are round! As soon as you see ’em, you think “I’m gonna stuff them!” They are probably picked early, though that’s only my guess, since I’m not familiar with the manner in which they‘re grown or harvested. I’ve only grown the usual zucchini which are long and thin, of course. 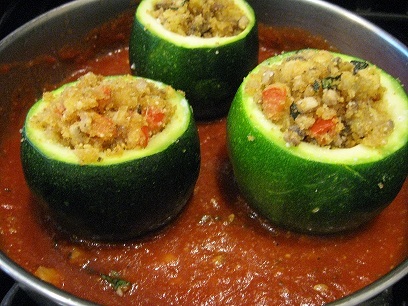 Now, if this recipe appeals to you and you aren’t able to find these round ones, you can certainly stuff the long shaped zucchini. Slice them horizontally and using a spoon, scoop or scrape out some filling creating an almost boat-like appearance. Save the filling to use in the stuffing as I’ll describe later. Don’t be turned off by the steps involved. It really is worth the effort! Save the filling that’s removed, as directed, and dice it. 1/5 of a red bell pepper – diced. First, wash the zucchini and then cut off the top, about ¼ from the top, trying to create a little “hat.” Using a sharp paring knife, remove some of the center to make space for stuffing. We’ve included lots of photos for this recipe to guide you. You need to leave enough zucchini inside though to provide some body to stand up. Save the filling you cut out. We’ll incorporate it into the other items for the filling. 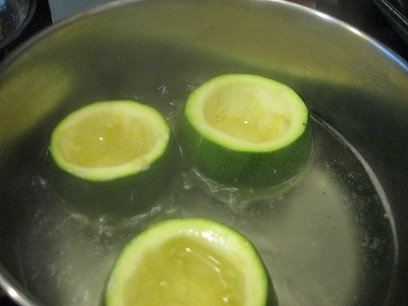 Place the hollow zucchini in a saucepan of water, but don’t submerge them. Water should only meet the zucchini half way up. Be sure to not submerge to zucchini in water! Cover pot. Simmer them for approximately 15 minutes, but keep carefully pressing the side to see if they are softening. Do not allow them to become mushy. We need some “body” in order to handle and stuff without falling apart. Using a ladle, gently remove from water and allow to cool on paper towel. In a skillet, add the oil and when heated saute the shallot and then garlic for a short time. Don’t allow either to brown. While they are doing this, mix the bread crumbs and grated cheese in a small bowl. Add the Salt & Pepper to this and combine. Set aside. Into the skillet with that onion & garlic, now add the chopped zucchini you removed from the centers, and the small amount of red pepper. Saute for 5 minutes, stirring frequently. Add the diced mushrooms and do the same. Lastly, stir in the bread crumb mixture and incorporate into the vegetables. Remove to a bowl or dish to cool slightly-just long enough to be able to handle. In a skillet that has a cover, place 2 tbsp Oil, and when warmed, saute the garlic and onion. Don’t brown, juts allow to become translucent. Add the can of crushed tomatoes and basil, a dash of salt and pepper. Stir well. 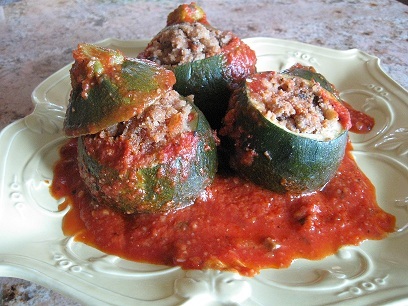 Lastly, place the filled zucchini in the sauce, and over a low heat, cover pan and simmer for approximately 30 minutes, stirring the sauce all around them frequently, making sure they don’t stick to bottom of pan. The zucchini stay in an upright position during the cooking. Never tilt over. I put the “hats” we cut off at the beginning, in the sauce as well to soften them. The hats aren’t essential to the recipe, they just look cute! LOL! Serve as a side dish with any entree, whether the meal is Italian or not…doesn’t matter. We love this with some crusty bread for sauce-dipping! Hope you’ll try this! And let me know if you do.